Dept. of Civil Eng. and Arch. Nat'l Taiwan Univ. of Sci. & Tech. In bridge engineering, maintenance strategies and thus budgetary demands are highly influenced by construction type and quality of design. Nowadays bridge owners and planners tend to include life-cycle cost analyses in their decision processes regarding the overall design trying to optimize structural reliability and durability within financial constraints. Smart permanent and short term monitoring can reduce the associated risk of new design concepts by observing the performance of structural components during prescribed time periods. 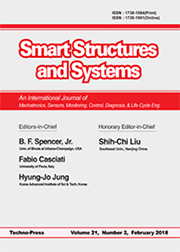 The objectives of this paper are the discussion and analysis of influence line or influence field approaches in terms of (a) an efficient incorporation of monitoring information in the structural performance assessment, (b) an efficient characterization of performance indicators for the assessment of structures, (c) the ability of optimizing the positions of sensors of a monitoring system, and (d) the ability of checking the robustness of the monitoring systems applied to a structure. The proposed influence line- model correction approach has been applied to an integrative monitoring system that has been installed for the performance assessment of an existing three-span jointless bridge. influence lines model correction approach; model updatimg; fiber optical monitoring systems; LVDT monitoring systems; proof loading. In this study, a Lamb-wave based damage detection approach is proposed for damage localization in plate. A sensor network consisting of three PZT wafer type actuators/sensors is used to generate and detect Lamb waves. To minimize the complication resulted from the multimode and dispersive characteristics of Lamb waves, the fundamental symmetric Lamb mode, S0 is selectively generated through designing the excitation frequency of the narrowband input signal. A damage localization algorithm based upon the configuration of the PZT sensor network is developed. Time-frequency analysis method is applied to purify the raw signal and extract damage features. Experimental result obtained from aluminum plate verified the proposed damage localization approach. damage localizations; structural health monitoring; Lamb waves; piezoelectric sensors; timefrequency analysis. long stay cable; vibration mitigation; MR damper; semi-active control; performance evaluation. frequency response function; dynamic stiffness matrix; receptance; damping matrix; minimization. In this research, a typical tension-leg type of floating platform incorporated with an innovative concept of underwater tuned liquid column damper system (UWTLCD) is studied. The purpose of this study is to improve the structural safety by means of mitigating the wave induced vibrations and stresses on the offshore floating Tension Leg Platform (TLP) system. Based on some encouraging results from a previous study, where a Tuned Liquid Column Damper (TLCD) system was employed in a floating platform system to reduce the vibration of the main structure, in this study, the traditional TLCD system was modified and tested. Firstly, the orifice-tube was replaced with a smaller horizontal tube and secondly, the TLCD system was combined into the pontoon system under the platform. The modification creates a multipurpose pontoon system associated with vibration mitigation function. On the other hand, the UWTLCD that is installed underwater instead would not occupy any additional space on the platform and yet provide buoyancy to the system. Experimental tests were performed for the mitigation effect and parameters besides the wave conditions, such as pontoon draught and liquid-length in the TLCD were taken into account in the test. It is found that the accurately tuned UWTLCD system could effectively reduce the dynamic response of the offshore platform system in terms of both the vibration amplitude and tensile forces measured in the mooring tethers. vibration mitigation; Under Water TLCD (UWTLCD); TLP system; experimental water tank testing; stochastic analysis.